Activists will hold a rally and vigil at 19th Avenue and Hazen Street at 4 p.m. Saturday. ASTORIA — Hundreds of people are expected to march through Queens this weekend for a rally calling on the city to shutter its jail complex at Rikers Island. The march will take place Saturday starting at 1 p.m. at 30th Avenue and Steinway Street, heading to the Rikers Island Bridge at Hazen Street and 19th Avenue, where a rally and vigil is planned for 4 p.m.
Police are expecting crowds of between 500 to 800 people, according to Deputy Inspector Peter Fortune of the 114th Precinct. "For decades, the notorious Rikers Island Jail Complex has been marked by violence and corruption and impervious to substantive reform," a Facebook event for the march reads. "The campaign to #CLOSErikers is calling for New Yorkers to boldly reimagine the city’s failed criminal justice system and become a national leader in ending mass incarceration." Glenn Martin, president of JustLeadershipUSA, one of the groups organizing the rally, said the campaign is pushing for "more humane and smaller" city jail system. "No matter what issue you're working on, if you care about social justice, Rikers Island is the belly of the beast," he said. "Rikers Island has served as the repository for New Yorkers who have failed out of all our other policy-making areas." 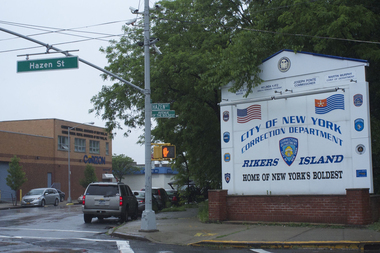 The de Blasio administration has been exploring the possibility of closing Rikers Island, DNAinfo New York first reported this spring. City Hall has quietly eyed several potential alternatives in the last year or so, including partially closing the island jail complex and shuttering it completely. For more information about Saturday's march, visit the #CLOSErikers coalition's website.